Click on the heading above to add a club logo. Clane United come from a confident 0-3 win away against Arlington AFC. Caragh Celtic has yet to be beaten in this competition, having won every game. Kynog United has yet to win in this competition, having lost its last 2 games. Caragh Celtic's last result was a comprehensive 1-5 win away against Newbridge United. Monasterevin AFC come from a disappointing 1-3 loss at home against BBC United. Caragh Celtic has yet to win in this competition, having lost all 3 games. BBC United take spoils against Caragh Celtic. BBC United has yet to be beaten in this competition, having won every game. Newbridge United lose to Caragh Celtic. Kilcullen AFC lose to Caragh Celtic. 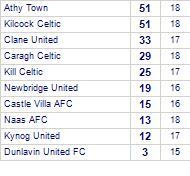 Kilcullen AFC has yet to win in this competition, having lost all 2 games. Kill Celtic despatch Caragh Celtic.